We left the Grand Canyon’s South Rim at 7:00 a.m. and headed out the east entrance to the park. 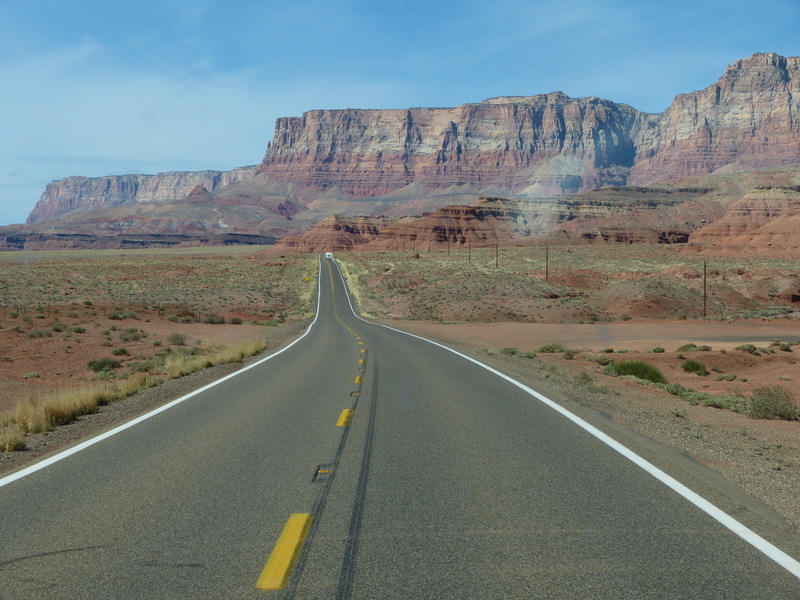 We chose to drive the Vermillion Cliffs Scenic Highway (89A). The drive winds through the high red cliffs and has frequent places to pull over and soak in the scenery. 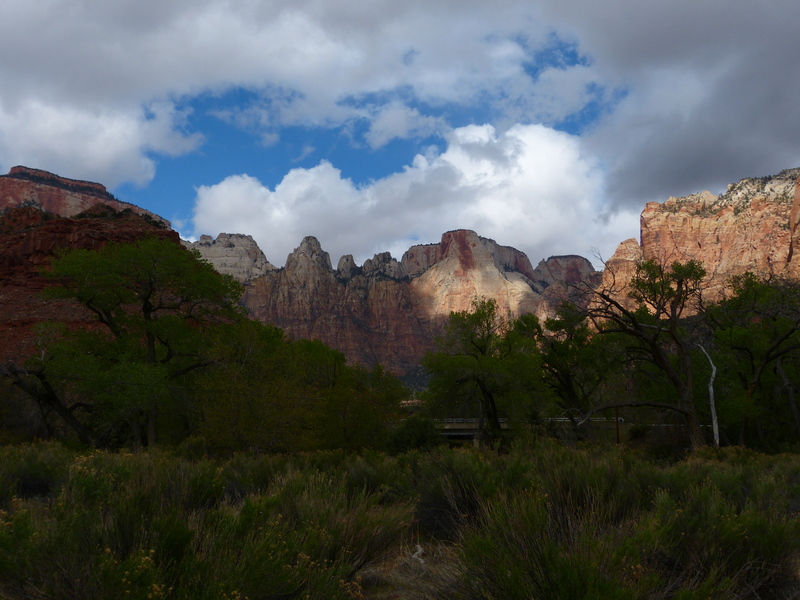 It is not the most direct route from the Grand Canyon to Zion, but was well worth the extra time. 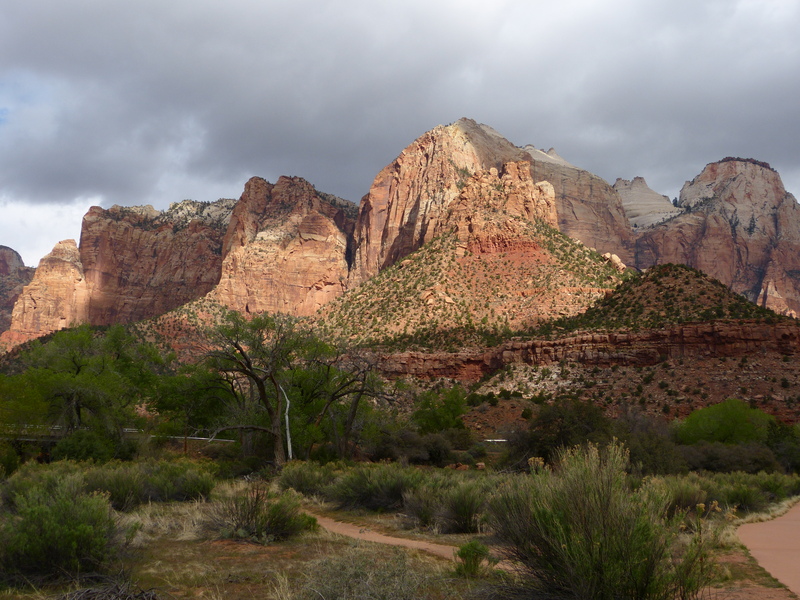 Upon arriving at Zion we found both the Watchman and the South campgrounds to be full! This surprised us, as it is still quite chilly and school is in session. 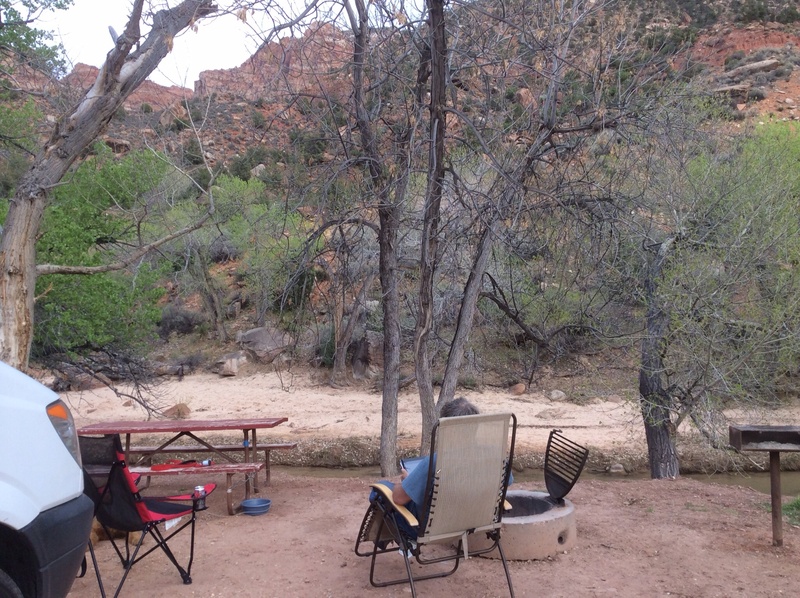 But, adjacent to the park entrance, at a commercial campground called Zion Campground RV Resort, we were able to get a site facing the Virgin River for 3 nights, then had to move away from the river as some one had reserved it later on. This campground was pricier than usual, at $42 per night, but it was the only game in town and provided clean showers, a large laundry facility, river front access, and had electric hook ups. The Springdale Shuttle bus stopped at the campground and we found it a breeze to hop the shuttle each morning to go hiking. 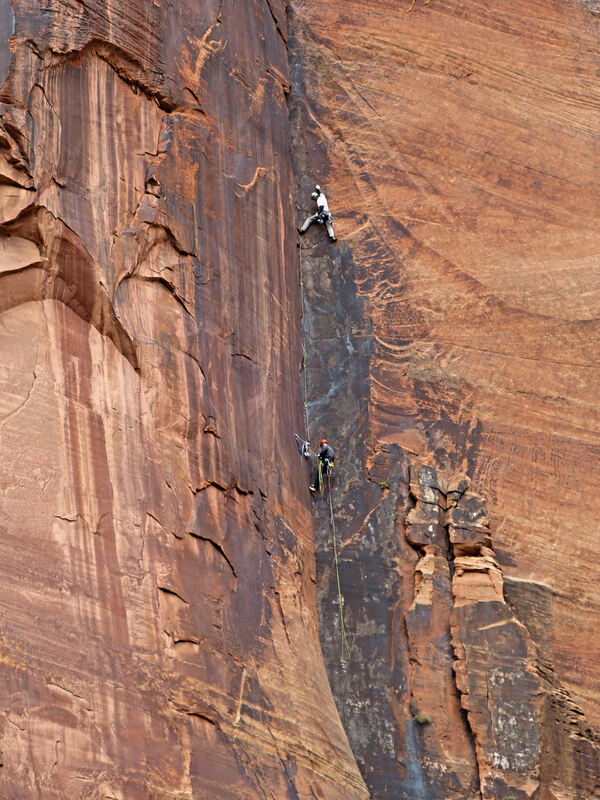 These climbers are simply amazing! 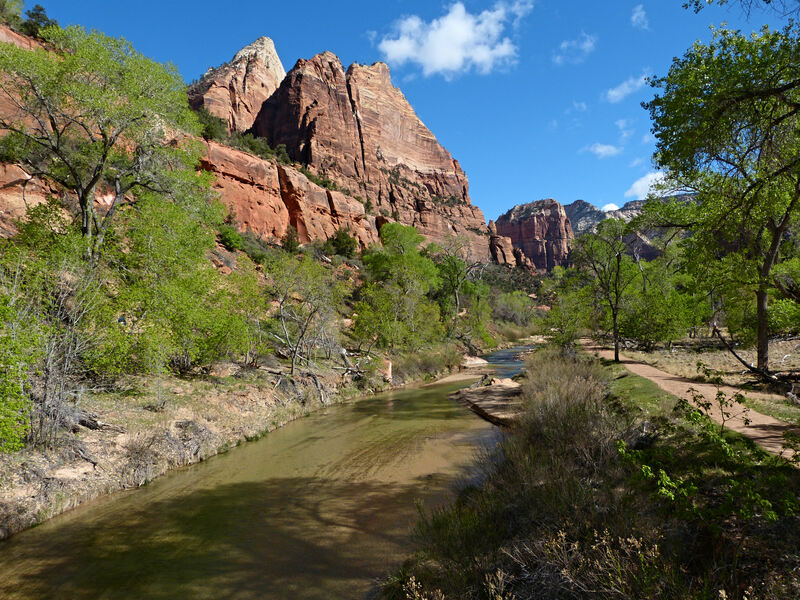 Zion NP only allows dogs on the Pa’rus trail, a combined bike, dog, people trail that follows the river in the valley and provides great views of the canyon. Most mornings we took Wooly Bear on this walk, 1.6 miles, prior to leaving him to go hiking in the park. The cool temperatures allowed him to comfortably stay in the camper, highs were in the upper 50’s and we tend to hike in the morning and be back at the campsite to check on him by early afternoon. Had it been warmer, we would have taken advantage of the doggy daycare place in Springdale. 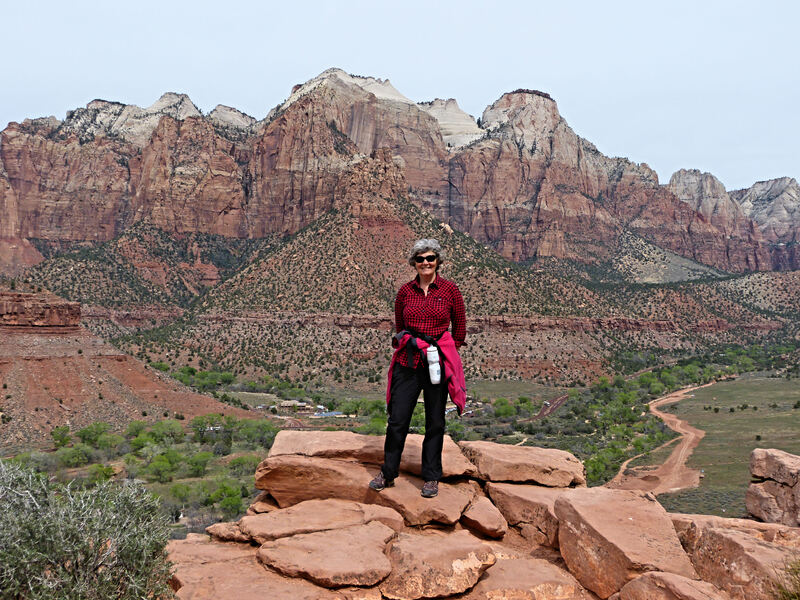 We have hiked each day and have thoroughly enjoyed our time at Zion NP! Now we plan to move on to Bryce Canyon. This entry was posted in Uncategorized on April 6, 2014 by Ramblin' Rose. It looks like a fantastic experience for all three of you! Thanks, Pam. I’ve seen your pictures of the snow in Newfoundland this spring. Unbelievable! Hi Sara, Charlie & WB – fantastic pictures as usual. Would love to be with the rock climbers rather than here. Keep the pictures coming. Thanks, Ed! Good to hear from you.